We are pleased to report on the success of START programme laureate Dr Tomasz Sulej from the Institute of Paleobiology of the Polish Academy of Sciences and Dr Grzegorz Niedźwiedzki from Uppsala University in Sweden. They described and named the largest dicynodont, a mammal-like reptile that lived in the territory of Silesia. The name the scientists chose for the youngest mammal-like reptile to have lived on earth is Lisowicia bojani. The genus name comes from the name of the village of Lisowice (near Lubliniec) where the fossils were found. The species name was given in honour of Ludwig Bojanus (1776–1827), a famed anatomist at the University of Vilnius. Dicynodonts are extinct therapsids, i.e. members of the group of synapsids that includes mammals and their ancestors. 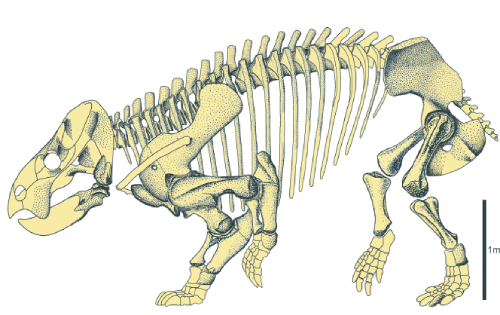 Dicynodonts are known from the Permian and Triassic periods, and in size ranged from a dachshund to an elephant of today. According to the scientists, Lisowicia bojani could have grown as large as modern elephants. They estimate that the animal was about 4.5 m long and 2.6 m high, and weighed about 9 tonnes. The fossils discovered by the Polish scientists come from the late Triassic in Silesia (205–210 million years ago). The new materials reveal many surprising features of the skeleton of giant dicynodonts. The discovery of Lisowicia dispelled the previously accepted views on the appearance of large herbivores in the late Triassic. Until now it was believed that this phenomenon involved only dinosaurs.